In woodturning, you use a wood lathe with hand-held tools to cut a shape that is symmetrical around an axis. Like the potter’s wheel, the wood lathe is a simple machine that lets you create a variety of forms limited only by your imagination. When the wood grain runs parallel to the lathe bed, the turnings are called spindle turnings. These include tool handles, candlesticks, egg cups, knobs, lamps, rolling pins, cylindrical boxes, Christmas ornaments, knitting needles, needle cases, thimbles, pens, chessmen, spinning tops, legs, spindles, pegs, balusters, newel posts, baseball bats, and hollow forms such as burial urns. 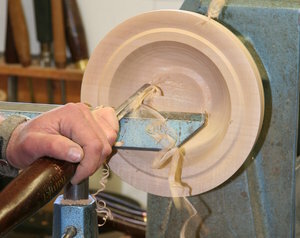 Bowls can also be turned spindle-wise. Turnings made with the grain of the wood perpendicular to the lathe bed are known as face grain or sidegrain turnings. They include bowls, platters, and chair seats. Automated industrial production has replaced many items traditionally made in turning shops. Today, small-scale turning shops and individual artisans produce limited quantities of functional spindle and faceplate turnings, as well as one-of-a-kind art pieces. In many parts of the world, lathes are small and portable, so turners can travel to the source of the wood or set up in a temporary work space. A skilled turner can produce a wide variety of objects with five or six simple tools. The tools can even be reshaped easily for the task at hand. Today’s turners find work making prototypes and molds, restoring furniture, continuing folk art traditions, and creating fine crafts for art galleries. In addition, turning appeals to people who like to work with their hands, find pleasure in problem-solving, or enjoy the tactile and visual qualities of wood. Book one of our many classes on-line https://www.thewoodturningstudio.ie/product-category/class/ or call us on 086 2684488. Give the gift of learning Woodturning with a voucher for someone special. Shopping in Gorey this Christmas?